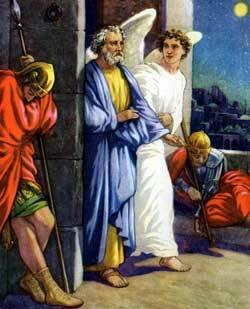 The angel said, "Wrap your cloak about you," and when Peter had done so they walked out of the cell, past the guards. T WAS MIDNIGHT; the streets were deserted and all was still. But even at this late hour not all the people of the city were fast asleep. A group of men and women were having prayer-meeting at the home of a widowed woman named Mary. For a long time they had been praying together, but still they continued to pray. These people were believers in Jesus, and again they were being persecuted. Their persecutor now was the wicked king Herod Agrippa, whom the Roman government had appointed to rule the Jews. This Herod was a grandson of the Herod who killed all the little children at Bethlehem when Jesus was a baby, and a nephew of the Herod who caused the death of John the Baptist. The church was much distressed by the loss of James, and now when Peter was taken they felt that they could not spare him too. So they prayed daily for his release. But the days passed, and still Peter lay in the dreary prison. Finally the last day came and went but their prayers were yet unanswered. So the church met together in Mary's home to pray all night. Peter was laying fast asleep, chained to two soldiers. Outside the prison door other soldiers stood on guard, for they knew that before another night Peter would be imprisoned there no longer. They knew about Herod's plan, but they did not know about the greater plan of God. Then the angel said, "Wrap your cloak about you," and when Peter had done so they walked out of the cell, past the guards, and on to the great iron gate which opened into the city street. To the home of the widowed Mary he went, for she had a son name John mark who was a friend of Peter's. When he came to the door of the gate and knocked, the gate-keeper, a young girl named Rhoda, called, "Who is it?" At the sound of his answering voice she ran into the room where the people were kneeling in prayer and cried excitedly, "Peter is come! Peter is come!" So delighted was she that she forgot to open the gate and let him in. But those who had been praying did not believe Rhoda's words. They said, You are crazed." Then they said, "It must be his angel.